Our proposal for the 2018 Tapestry Design Prize for Architects imagines a tapestry which oscillates between the room and the wall, which pushes and pulls against the 2D realm, and which provides a new viewing experience for the visitor. The abstract form suggests something strange but familiar, allowing unseen geometric forces to play with the woven texture. Ever changing with the light of the day and angle of view, the design explores collage, pattern-making and tailoring techniques to achieve the desired voluptuous effect, all rendered in only black and off-black thread. We have started design concepts for a new exciting project in Dulwich Hill – a renovation and extension of a unique free-standing terrace house on a corner site. We are looking forward to the next steps of developing the design further. We are delighted to have House Howley shortlisted in the Houses Awards in both the alts and adds over 200m2 category and the landscape design category for Melissa Wilson’s beautiful garden. All photos by Tom Ferguson. Congratulations to all shortlisted projects. The house has recently been published in HOUSES magazine as well as in the Home Magazine section of the Sunday Telegraph – link to article here. Our latest project for a new residence in Russell Lea has begun construction with our long time building collaborator Ferrocon. The existing house was demolished just after Christmas, and the concrete slab for the ground floor poured soon after. Feature face brickwork for the ground storey has been completed and we are very pleased with how the house sits in the streetscape. The timber framing for the first floor is nearly finished and we look forward to reaching lock up stage soon. Our industrial conversion project in Marrickville is progressing well. The design re-uses the shell of an existing joinery factory to provide a carpark and 6 apartments on the site. The main material feature of the project is a variety of face brickwork surfaces, including large areas or articulated recycled bricks. Completion is expected later in the year. We are excited to see our House Howley project is published in HOUSES magazine this month in the issue titled ‘What’s Old is New Again’. Thank you to Tom Ferguson for the outstanding photos and to Rebecca Gross for the lovely words. Great to see all the other fantastic projects in this month’s issue - you can find a copy of the magazine in stores from the 3rd of April. We have submitted our Telescope House project in Russell Lea for planning approval. The project involves restoration and extensions to a heritage-listed weatherboard cottage in a conservation area. The design has been carefully planned to make best use of the extremely narrow but long site and the extensions are informed by the pitched roof forms of the original cottage. We have recently completed our alterations and additions project in Bardwell Park, which included a renovation of the existing cottage, a new living pavilion at the rear, and a small free-standing pottery studio in the backyard. The clients have happily moved back in and we are looking forward to seeing the house slowly filled with a variety of artworks, vintage furniture pieces, collectables and ceramics. The house will be photographed later in the year. The project was constructed by the excellent team at Miso Building. Our clients have now moved into the main house and work has begun on the second stage of the project – converting the museum building into a pool house. We are also focusing on finishing all the hard and soft landscaping designed by Melissa Wilson Landscape Architects. We are looking forward to photographing this project later in the year. 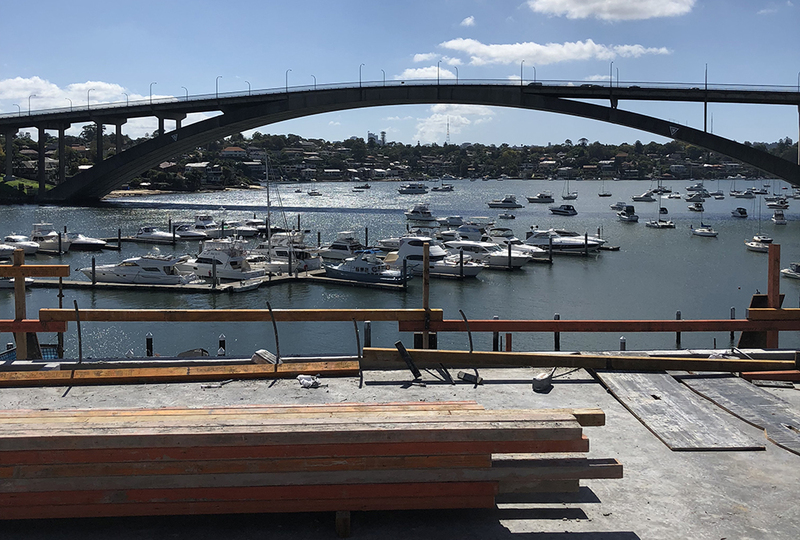 Progress at our apartment project in Drummoyne has picked up momentum again after the Christmas break. The final post-tensioned concrete upper floor slabs have now been poured and we are ready to move onto the roof steel-work and finishing trades. We are excited to announce that the new Campbell Park amenities block in Chiswick is now open to the public after completion earlier in the month. We look forward to locals and visitors using this facility during the coming soccer season and hope it will serve the community well into the future. The project was completed with funding from the state government, City of Canada Bay Council, and made possible by the support of the Abbotsford Juniors Football Club, with construction by Mansfield Corporation. It includes a new café and community hall, as well as change-rooms, referees room, public toilets and sporting equipment storage areas.